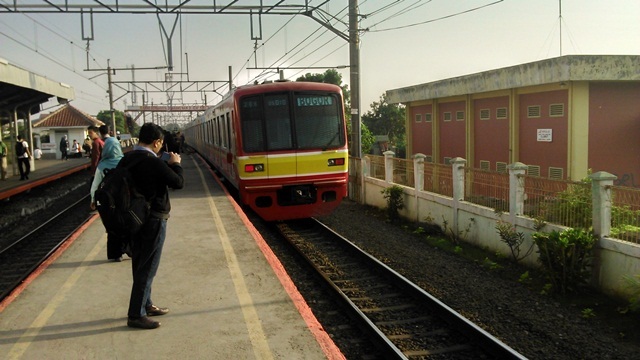 Like also many other countries, there is a commuter train service in Indonesia. It provides similar service to Tube in England or MTR in Hongkong. 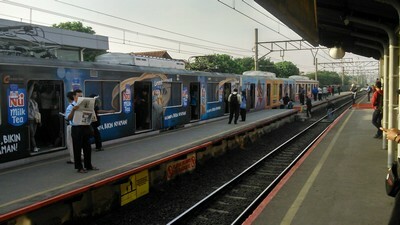 The Indonesia Commuter Train services connect Jakarta, The Capital of Indonesia with its four satellite cities Bogor, Tangerang, Bekasi, and Depok. Its operation is handled by Indonesia Railways Company, called PT KCJ (Kereta Commuter Jabodetabek). Trains used are mainly ex-Japan electric train and equipped with air conditioning. The railway itself utilize the ones developed by Dutch when they were here. The remains of Dutch architectural style can be seen in the Jakarta and Bogor Station. Both stations are the oldest among all stations and their ages are more than 100 years ago. The stations were developed back to year of 1872. There are five different lines, Blue, Yellow, Red, Green and Brown. Three main lines are Blue that relates Jakarta with Bekasi City, Yellow connect Jakarta with Depok and Bogor and Brown with Tangerang. The longest line is the yellow one. The distance can reach 42 kilometers if it’s counted from the first station in Jakarta to Bogor Station as the end of the line. The distance of the farthest journey can be more than 50 kilometers. If you travel less than this, the cost will even much lower. The fare can be such low because it is still subsidized by government to attract people using more public transportation than their cars. 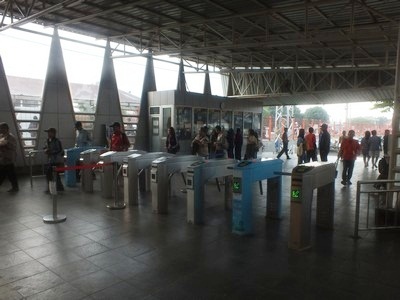 The ticketing has used e-ticketing system. Passenger can use a vending machine or go to ticketing counter to buy a ticket. An officer should pass you a card which is needed to open entry or exit gate. The automatic vending machines are still available only in several stations only. Is it convenient to use the commuter train service? Convenient or not is really just about perspective. It depends. Having experienced traveling by the same train service in several developed countries, then I can say, it is quite reliable and convenient. The passenger cabins are air conditioned. No other persons except passengers and train staffs are allowed to enter the station and trains. This makes it quite convenient for passengers, not like few years ago. Stations are clean and equipped with decent and proper facilities, like toilet or praying rooms. Most of them are equipped with few stores from where passengers can buy breakfasts or small things needed. On few bigger stations, you can wait for your trains in Starbuck or MacDonalds. Gadget charging facility is also available, free of charge. Security guards patrol inside stations and trains. They also provide any help or information if needed. However, like also other countries train services, it won’t be so convenient in rush hours. The services are used by more than 700,000 people every day. 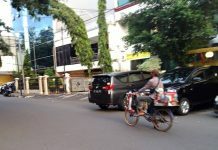 Most of them are commuters that live in satellite cities and work in Jakarta. So, if you travel using commuter train services at the same time with salary-men/women’s time going to work or back home, then it is not so comfortable. Crowded. Some English written newspaper mentioned about how unreliable services provided by this commuter train service. Some problems were mentioned to be the causes like quite often derailed, or almost delayed. I have been using the services for almost 28 years. The current ones have been so much improved and better than before. Of course, what has been mentioned on the news was not incorrect. Some cases of derailed occurred recently. But, they forgot to mention clearly how many times a month derailing cases happened. For sure, it is not every month. It’s an accident. About delays? I must admit. Everyday, the trains are delayed, mostly the arrival schedule. Usually, it is punctual on departure. It is safe to say 15-20 minutes arrival delay from what the time table says. I solve the problem by adding 20-30 minutes allowance to my schedule. 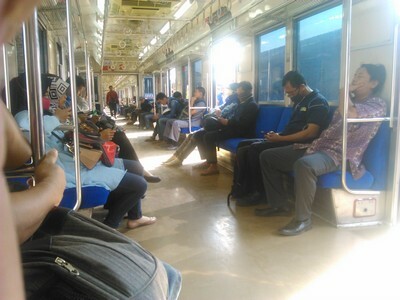 Even after the delay time is included, the commuter train service performs better than driving or riding from Bogor (or 3 other cities) to Jakarta. In total, it takes only 1.5-2 hours. Compared to 3-3.5 hours if I drive a car in rush hour, then using train is preferred. Besides, it’s much cheaper. Therefore, if you come to Jakarta and want to take a visit to my hometown, Bogor, I would like to suggest to use our commuter train service. It’s safe and cheap.